The H2OGO! Snow Frost Blitz double tube brings twice the action to your neighborhood sledding attraction. The two-person, saucer shape is a great design for fast-paced, spinning action down the Hill. Each seat has its own set of sturdy handles that help with steering control and add safety value. 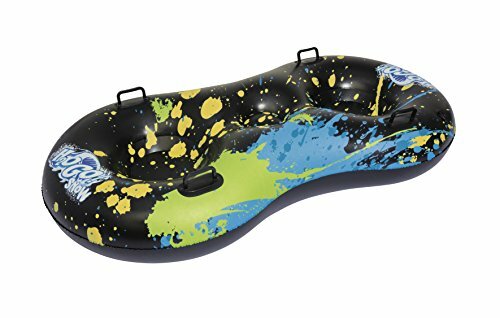 The Frost Blitz double sled is made with Polar shield material which is a specialized form of PVC that works to prevent punctures and withstand cold weather conditions. Getting started is easy! locate the quick release valve to inflate. Once inflated, the valve folds securely into the tube for uninterrupted sled runs. Best of all, you can neatly pack up your Frost Blitz snow tube when it’s time for storage.